This 2 room apartment (4 persons) is located in in a charming holiday resort in Giardini Naxos / Recanati just 700 mteres from the beach. 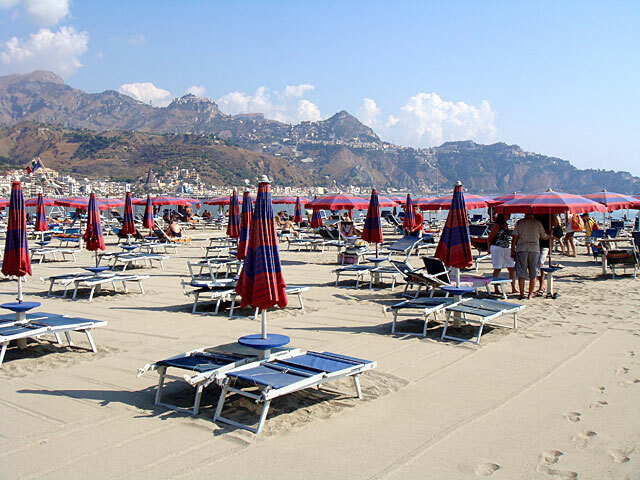 The holiday resort is located in green surroundings and offers all the amenities for a complete beach holiday in Giardini Naxos - Taormina. The very family-friendly facility has a swimming pool, tennis court and children's playgrounds. This is the right place for having fun and also for relax. The resort has a restaurant, bar and snack bar. Here it is recommended to arrive by car. A parking space in the village is included in the price. The holiday resort Giardini Naxos is situated near Recanati which is a part of Giardini Naxos. The apartment is air-conditioned, but does not have TV. There is a common use TV room in the reception building. Please note: The displayed photos represent the respective apartment category, the actually recieved apartment can slighly vary from these photos. All apartments in the same category are equivalent. 24 hours' reception desk In high season (july - august) arrivals e departure only saturday. *Early booking: The indicate days refer to the number of days you need to book before check in. ***Security deposit: Will be returned at departure, if the accomodation is left in a proper state.